The “Phat-Brace”, or Energy Storing AFO, produces a plantar flexion force that can replace an absent or supplement a weak calf muscle. This plantar flexion force can also stabilize or que the knee into position during standing and/or through stance phase of gait. Secondarily the orthosis will maintain dorsi-flexion during swing phase of gait. 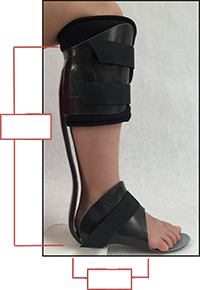 Any pathological condition that has developed a weakness or absence of calf strength, (plantarflexion strength) would be well managed by this orthosis design. If the patient has also developed a valgus or varus ankle breakdown. Resulting in internal/external rotation of the foot in relation to the forward line of progression of the knee. This orthotic design will be limited in its effectiveness of returning close to normal functional results. If the rotation deficits are flexible and the patient can be returned to a neutral alignment, or within 10 degrees of neutral, a prefabricated orthosis may be able to produce very close to the same functional outcomes as a custom made orthosis. If the patients Valgus/Varus deficits are more involved they will require a custom made orthosis. In the more involved conditions a prefabricated orthosis can cause skin breakdown and be harmful to the patient. A orthotist with training and experience with this system should be the one to determine if a patient is a candidate for a prefabricated orthosis. The company does not guarantee or warranty the orthosis unless it is fit by a trained orthotist.